_MAL4569, originally uploaded by Michael A. Lowry. I returned yesterday morning from a fun weekend of salsa dancing in Göteborg. The weather there was absolutely lovely, with clear skies and warm sunshine every day. Here's a photo I took on Saturday while walking down one of the city's main shopping streets with Tove, fellow dancer and girlfriend of one of my traveling companions, Vladimir. 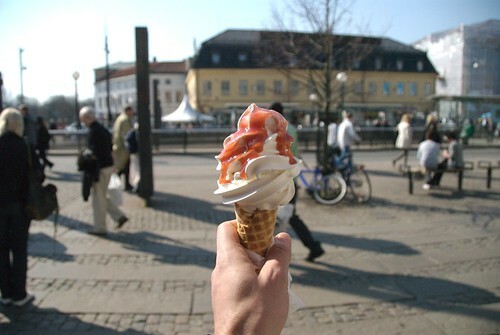 Tove and I stopped for an ice cream. I had soft vanilla ice cream in a cone, with strawberry topping. Yum! I took several thousand photos during the weekend, and have selected more than six hundred of the best ones. I will upload them soon!